When Barack Obama signed what was touted by the mainstream media as the middle-class cut bill on December 17, 2010, it was praised as a historic measure which would extend tax cuts for families at every income level, renew jobless benefits for the long-term unemployed and enact a new one-year cut in Social Security taxes that would benefit nearly every worker who earns a wage. But first of all, extending last year’s tax rates actually didn’t do anything for anybody (i.e. nothing gained, nothing lost). Secondly, renewing jobless benefits for the long-term unemployed was simply the price we had to pay for a failed $887 billion economic stimulus program. Thirdly, and to the point of this blog post, as far as the one-year cut in Social Security taxes, exactly what does the term “nearly every worker” mean? Well, just two months after its enactment, tens of thousands of American’s are beginning to find out. Many are noticing that their paychecks are actually smaller than they were last year, while others are seeing just an extra dollar or two per month. In fact, the only ones actually receiving the full 2% payroll tax cut are those making over $70,000 per year. Those making under $20,000 per year are actually ingesting a tax hike. In an effort to determine why so many folks are complaining, we compared Internal Revenue Service Publication 15, (Circular E) Employer’s Tax Guide, for tax year 2010 to the 2011 publication. Then we created a spreadsheet to compare the differences. What we discovered is that in 2010 the amount of federal income tax withheld from paychecks was lowered, to compensate for the $400 Make Work Pay Credit. But with the expiration of the credit at the end of 2010, income tax withholding tables have been readjusted back to pre-stimulus levels. This adjustment in income tax withholding rates has completely negated the Social Security tax cut for the poor, and greatly reduced its effect on those with moderate incomes. On its face, the new law lowers the amount of Social Security tax withheld from all paychecks from 6.2% to 4.2%, however not all paychecks are affected equally. Had this tax cut been implemented on its own, it would have been a good thing for all wage earners; however due to the corresponding expiration of the Make Work Pay Credit, the end result favors those making over $70,000 per year, and discriminates against those who earn less. The word on the street is that Obama’s 2% Social Security tax cut is just one more in a series of lies emanating from the White House. If we could impeach a POTUS for lying (or ignorance), Obama would have been impeached 10 times over. The following calculations are based on the IRS’s monthly percentage method tables for single taxpayers (Table 4). If you’re not convinced, you may always visit www.irs.gov, search for Publication 15, and make your own assessment. But if you don’t want to go through all of that trouble, you can simply compare your latest payroll tax report, or pay stub, to one from last year. As the table above displays, rather than receiving a tax cut, those making $15,000 per year, or less, are actually receiving at least a 0.68% payroll tax hike. Although this may not have been the Democrat’s intent, this is what he delivered. According to the table above, those making exactly $20,000 per year are receiving a mere 0.08% tax cut. Wow, that’s a whole $1.13 in tax savings each and every month, leaving many on Main Street in shock and awe. Since those making under $20,000 all got a tax hike, those whose lives have been improved by a buck a month must be so proud of their Democratic saviours. The next table (above) reveals that although those making $30,000 per year received a bona fide tax cut, it is effectively only 0.88%, or $17.80 per month. I suppose $17.80 per month, which equals $213.60 per year, will have some impact on the economy, but not likely much. 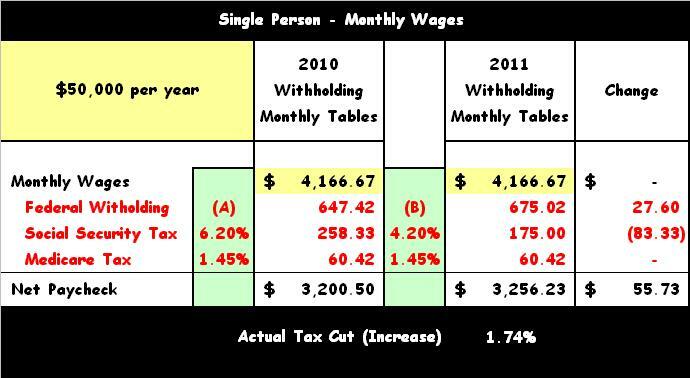 The table above shows that those making $40,000 per year are receiving a 1.48% tax cut. Although it’s not a full 2.0%, the extra $39.07 per month can at least be banked, or perhaps donated to the poor and needy. As the table above exhibits, those making $50,000 per year are receiving a 1.74% tax cut. Now we’re talking real money, a whole $55.73 per month, although perhaps this would have been more appropriately directed toward those making less than $20,000. The table above affirms that those making $60,000 per year are now taking home a 1.92% tax cut. It’s getting there, although it’s not quite 2%, an extra $72.40 per month can at least buy some extra food, or pay a bill. Then again, if you’re lucky enough to still have a job paying $60,000 per year under the present regime, how important is an extra $72.40 per month? Finally as exposed in the last table (above), those making $70,000 per year are picking up the full 2% tax cut and then some (actually 2.15%), a savings of $92.89 per month. The percentage of taxes saved tops out at about the 2% level with the monthly dollar amount continuing to advance up to the $106,800 cap on Social Security wages. In conclusion, those who needed a diminutive tax cut the least are receiving it the most. It all goes to show that in spite of a far left-wing progressive like Obama, “The rich keep on getting richer while the poor get poorer.” While other countries like China directed payroll tax cuts toward employers, you know, the ones who can actually provide jobs and a real boost to an economy, Obama has blown his 3rd and final chance to get it right. Three strikes and you’re out! Perhaps our next POTUS will be one who not only takes the time to read the bills presented for signature, but one who is actually capable of understanding cause and effect. 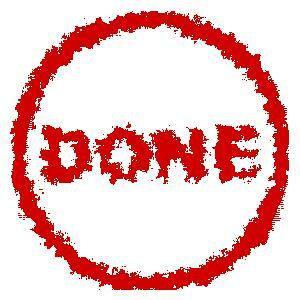 Obviously, the present White House occupant is a wash. Obama is ‘one and done’, but in terms of American jobs, this could be more effectively expressed as ‘none and done’.